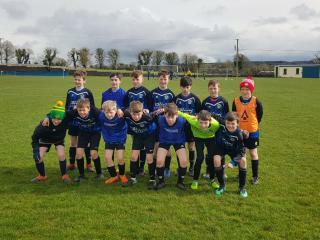 The heavy rain put paid to most local club matches last weekend but the U12 boys (pictured) had an impressive 4-2 win away over St John's of Roscommon in their Connacht Shield quarter final clash on Saturday. Dara Zimmerer with two, Paddy Malone and Jack Murray were the goalscorers in a very good display of football. There were strong performances across the whole team with Jack Murray and Eoghan Mulleady impressing in midfield, Louis Keary marshalling the defence excellently in front of the ever improving Oisin Bergin. Colm Doyle continues to pose big problems for defences with two assists in this match. Elsewhere the U14 boys lost 5-0 away to Knocknacarra B in their Divisional Cup encounter.